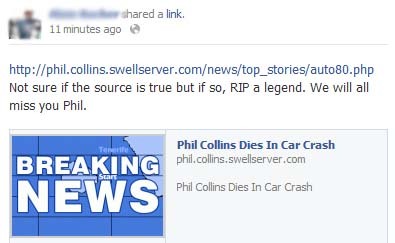 Phil Collins is the latest celebrity death hoax spreading rapidly on Facebook. This is the same bogus site that created the Vanilla Ice hoax earlier this month. 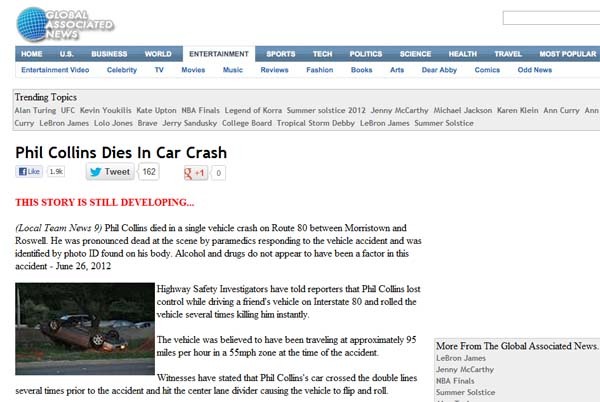 Clicking the wall post takes you to http://phil.collins.swellserver.com/news/top_stories/auto80.php – a peculiar URL for a news site, huh? Also, none of the news category links are active either. The only working links are ones to other bogus stories.